Action cameras market has been recently flooded with all sorts of these devices, so it’s not that easy to choose the one you need among all this diversity. You might be wondering how to buy the best action camera? Despite that all of them are completely simple in use and their task is just “to record video of maximum quality under any conditions”, still it’s quite easy to make the wrong choice. What’s the bottom line? I’ve tried to dig into this stuff and I’ve made a list of the best action cams as well. There also some recommendations as for choosing an action-cam and a summary of all above mentioned – all of these is here, in this review. Now here is the absolute leader – it is GoPro Hero 6 Black. This action camcorder has maximum functions that you can only expect from such a device. But not everyone is ready to pay its price and not all of the users need all these super functions. If you are looking for something a bit cheaper, you can consider Xiaomi Yi 4k. Yi 4K – is a well developed device with lots of filming and photo shooting modes. The video quality is quite good for an action camera and 4K videos filmed at half-lights appear to be of rather acceptable quality. Remote control of the camera by means of Wi-Fi performs proper as well; the device operation duration in off-line mode is above all praise. This Xiaomi camera turns on quickly and it has a self-explanatory menu which is beneficial for its user as well. As for the camera price – shall it be considered as its downside or benefit? When contrasted with prices for SJCAM M20, GitUp Git2 and AKASO EK7000 4K cameras, which have rather sufficient price/quality ratio, Yi 4K price seems to be rather high. It is two fold higher than that of the above mentioned camcorders. However, we should keep in mind that this camera is of completely different level. It is capable of filming in full-scale 4К, 2.7K modes at 60 FPS and 1080 up to 120 FPS, which the aforementioned cameras can’t perform and it makes Xiaomi camera a rival to those higher priced ones – such as GoPro Hero4 Black Edition and Sony FDR-X1000V. Furthermore, their price is almost twice higher than that of Yi 4K. Therefore, this camera won’t become a mass-market one because of its price. However, if you do need a camera with filming quality of such level – in this case its price turns into a substantial advantage when compared with its highly expensive rivals. 1 Now: what is an action camera and what is it for? 5 Now: which SD card to choose for an action camera? Now: what is an action camera and what is it for? An action camera is a digital camera for recording video in aggressive media while you are being involved in the motion and it’s not intended for manual filming. Mostly it is used by travelers, thrill-seekers, journalists, military officers and so on. The device is put on cars, helmets, serf-boards, bicycles, clothes and sports equipment. Camcorder has to record the brightest and most interesting events of your life. The device features are: its small weight and size, it is waterproof and it has dirt-guard system as well as different fixations for different surfaces. Due to the latter feature the camera can be put anywhere and so you can get video from incredible camera angles. Most models can even be used for filming under water. First action cameras were developed by GoPro Company and it has become a leader in this room in the market. Though besides its products a lot of other camcorders have appeared on the market and quite often they are of the same quality and cheaper. In October 2017 GoPro introduced its new flagship camera Hero 6 Black. When Hero 5 was manufactured it could be surely called the best action camera, since it contained all the most important components from the previous GoPro models with a small number of new useful features. GoPro Hero 6 Black was designed according to the same principle. Let’s look into the differences between GoPro Hero 6 Black and Hero 5 Black to find out how exactly better the new device is and whether it is worth buying? Or maybe your old camera is still good enough? These cameras are identical if we talk about their appearance. It means that any of them has quite firm rubber coated case and embedded damp proofing, that perfectly works up to 10 meters deep without the necessity to put an additional waterproof case. Both models are equipped with 2 microphones. The main GoPro Hero 6 Black improvement isn’t about its design; it is all about its new processor GP1. This processor allows filming higher resolution video at higher fps speed if compared to Hero 5 Black. Hero 5 Black maximum resolution is 4K at 30 fps, while Hero 6 Black now is capable of filming 4K video at 60 fps. If we consider slow motion filming option – Hero5 Black could film only at 240 fps at low motion and with low resolution – 720p. With Hero6 Black action camera you can now film 240 fps video with higher resolution – 1080p. For many users both improvements can be considered as important ones, since now these parameters allow taking “smooth” pictures with high resolution and high quality slow motion video filming. Moreover Hero 6 Action camera can film 2.7К video at 120 fps. GoPro representative has announced that GP1 processor will ensure the device operation under low light level as well as improve its dynamic range. However, now it’s impossible to check out to what extent the above mentioned parameters will be elevated. Another new feature of Hero 6 Black is its hand-activated scaling that provides digital zoom function. Such scaling will worsen the image quality if compared to optical zoom function. However, if you have no chance to get closer to the action you are recording that option will be rather helpful. However, this mode can’t be called new from the technical point of view. Both action camera models support digital image stabilization, but GoPro has stated that Hero 6 Black has the most advanced image stabilization function. At that the manufacturer implies that GP1 processor is to ensure some additional support for software stabilization. GoPro Hero 6 Black unlike Hero 5 will support digital image stabilization at 4K / 30 and 1080p / 120, which is very good. In fact, image stabilization works at any resolution not just for some specific parameters. Basing on some tests performed with Hero 6 Black this improved stabilization function is actually a big step forward in comparison with the previous model. If you record video with Hero 6 Black when walking, the frames you get appear much sharper. Let’s face it, GoPro Hero 4 Black Edition is quite an expensive stuff. 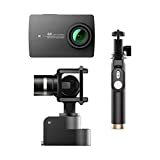 But for this money you get a highly protected device which is capable to record video with the highest resolution Ultra HD in a wide range of operation environment, use slowmo mode, create TimeLapse and a lot more. In other words the GoPro model has no rivals and this means that if you are looking for an action camera that meets the highest requirements, then GoPro Hero 4 is the 1st device you should set your eyes on. However, if you need a camcorder just to memorize some important events of your life, then «GoPro Hero4 Black» is kind of luxury you may not need. In HERO4 series this is the best camera as for recorded video quality. Its filming modes allow recording with resolution 4K or full HD (in slow motion mode at 120 fps), which is close to a standard full HD 1080p mode. The camera supports filming in Time Lapse, Night Photo and Night Lapse modes, to create photos and video simultaneously, there is ability to record video in H.264, and HiLight Tag mode allows pointing key moments while filming. SuperView mode allows capturing quite wide scenes, which is rather important when recording seascapes and sky views as well as spots competitions. The camera can also shoot photos series at 30 frames per second; it has Time Lapse function that puts delay between the frames from 0,5 to 60 seconds. When shooting the sky at night, it’s better to use Night Photo and Night Lapse modes with optimized exposure settings. Add extra-wide camera angle on top of all of that and we get the best action camera as for reliability and performance. 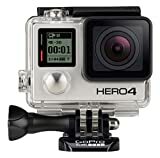 The camera standard equipment includes GoPro Standard Housing that preserves its leakproofness when diving up to 40 m.
Besides this protective containment housing prevents the camera damage when riding on a motor bike and when doing other extreme sports; there is a wide range of accessories for this camera on the market as well. Short duration of offline mode operation; the battery runs down fast when using WiFi. After putting on the market its previous model Xiaomy decided to consolidate the success and at the end of 2016 the company created Xiaomi Yi 4k. Xiaomi Yi 4k action cam – is a new 4К action camera for sports. It has 12 megapixel matrix Sony IMX377, its pixel's size is 1,55 mkm, aperture is equal to f/2,8 and the camera angle is rather wide – 155 degrees. Xiaomi Yi allows 4K filming at 30 fps. You can also record video in slow motion mode with 1080p resolution at 120 fps as well as 720p at 240 fps. Due to 12-MP sensor Sony IMX377 and Ambarella A9SE75S chipset the camera is capable of filming 4K video at 30 fps as well as slow motion 1080p video at 120 fps and 720 p at 240 fps. Unlike the first version of Xiaomi Yi the new device is equipped with 2,19-inches touchscreen with 330 ppi pixel density. Which means that now you can adjust the device and watch the filmed video right on the camera screen without connecting to a smartphone. The device case has a portrait orientation, however, at that its size doesn’t exceed the one of its rivals. YI 4K Action Camera records 4K/30fps (100mbps), 1080p/120fps, 720p/240fps video and takes 12MP photos using a 155°wide-angle lens with F2.8 aperture. Built-in 2.19" LCD touchscreen with 640 x 360 HD resolution for easy previewing. Comes with compatible YI Selfie Stick&Bluetooth Remote - features a simple twist-and-lock function and rotates 360° horizontally, 180° vertically and is adjustable from 7" to 28". Includes a travel case, making it compact and portable for all of your adventures! Xiaomi Yi II has a dismountable battery of 1400 mA/hrs capacity, which ensures 110 minutes of 4К video recording, 2 hours of 2K video filming or 8 hours in a standby mode. high resolution ability and coding quality, numerous number of filming and operation modes, standard screwed fixation, longstanding 4K video filming without any extreme overheating, perfect touchscreen according to action camera standards, quite good electronic stabilizer (keeping in mind that most of mini camcorders doesn't have any at all), quite low rolling shatter effect, wide range of settings, affordable price. The company programmers deserve a special credit for the camera software and its mobile application. One may hardly ever encounter such a functional software. However, it is quite difficult to discuss any demerits of the device, since, to do this we'll have to compare this camera with other similar devices. Though, rather poor package contents of Xiaomi Yi II can be considered as its drawback as well as the device nonstandard size. Nevertheless, the first issue actually becomes a plus for the camera buyers - because due to a small range of accessories the whole camera set is cheaper. As for the camera size that doesn't allow using it in waterproof cases made by other companies – it is due to the device internal design and, sadly, nothing can be done in this respect. Perhaps, a waterproof case for Xiaomi Yi II is the only branded accessory that those fans of underwater filming will have to buy, because the camera is already equipped with all the rest. When using this action camera you’ll be able to both record your location defined by the embedded GPS unit and dive up to 50 meters deep without using a waterproof case! Probably this is the best hunting action camera. Garmin Company is another one manufacturer of camcorders who demonstrates ambitions and aspiring plans to capture the action cameras market. The company has upgraded its Virb product line quite noticeably by presenting Virb X and Virb XE models. Their main difference is the ability of XE major version to film video in 1080p format at 60fps, and the minor one is capable of the same thing but at 30fps. First that thrills any fan of extreme filming is that you can dive with camcorder Virb XE up to 50 meters deep without any additional cases or boxes. BURST CAPABILITY - The VIRB X and VIRB XE offer a burst shooting mode that will capture several photographs in quick succession so that you don't miss the action. The camera is already manufactured in a waterproof firm case that can stand 5 atm pressure. Due to such a convenience the camera has become a hit among those who love recording their underwater adventures. Another additional bonus is an embedded digital stabilization and GPS-sensor, gyroscope, accelerometer, compass, Wi-Fi, Bluetooth, microphone, USB-port, proprietary plug connector, small display. The camera operating life on one battery charge equals 2 hours, when all wireless modes are on simultaneously. It can synchronize with any mobile device that allows controlling it remotely by means of some special free software. The second generation of Garmin action cameras turned out to be quite innovative and advanced product capable to press its rivals essentially on the market. «Garmin Virb Elite» camera is supplied with an adapter for GoPro fasteners, so it can be easily used with any of GoPro accessories. In general the whole package of the camcorder is great including the software set «VIRB Elite App», apps for iOS and Android, as well as the possibility to edit the software for Mac and PC. The camera is equipped with GPS, which traces the user location when the device is on and it applies your route coordinates to the video. The action camera has a Wi-Fi unit that allows managing shooting process or watching the filmed video. The device has the function of image stabilization which sufficiently decreases the number of distortions appearing due to vibrations on poor roads. Actually, this device is for extreme sports fans, which are just beginning and have a limited budget. They’ll especially enjoy dust and water proof covering of the camera as well as the possibility to put Cube into the water up to 5 meters deep (but only in a waterproof case!). 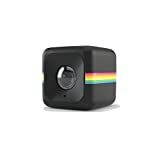 Polaroid Cube is rather specific action camera within budget ones. Possibly, it is the easiest camera to master: it has only one button (1 click turns on “photo” mode and 2 clicks – “video”). Its resolution is fair 1920 x 1080 p. Modern H.264 is used as a codec in it. It became possible to obtain these parameters by using 5MP CMOS matrix. An increased rapidity is ensured by F2 diaphragm. The lens focal distance is 3.4 mm, which indicates very wide camera angle. Everything that goes around will surely be filmed. The camera doesn’t have an LCD display – this ensures rather longstanding offline mode operation. The image stabilizer is also missing here. But the case has rather good-looking design with branded multi-color stripes. This small camera weighs 45 grams and it can be put under the water up to 5 m deep. The gadget has a magnetic holder which makes buying some other accessories unnecessary and you can use the camera when riding a bike, for example. However, be careful here, since the camera doesn’t have a motion sensor and if you turn it upside down the image will do the same. In 90-s Polaroid Company was famous due to its snapshot cameras. Many years have passed since then and the brand has been forgotten by quite a lot of users. Nowadays this manufacturer is trying to draw attention to itself. The company has started from producing the simplest action cameras for sports. First of all Polaroid Cube attracts with its low price – it costs the money you may spend to buy a simple camera. This camcorder has two large advantages. Firstly, is its weight – it is the lightest one from all – 45 grams. Secondly, it has the best price. Yes, it’s true, that the camera is far behind its main rivals as for many parameters, but it costs 3-4 times cheaper. As a budget device the camera does frankly good work. It allows taking photos and recording videos maybe of not the best quality, but still they are quite good. Polaroid Cube appearance is quite attractive for users, especially for woman. Its case is covered with soft touch plastic. It is a perfect and, what’s important, a budget choice of action camera having all necessary functions and parameters. It has widescreen video recording mode, Full HD shooting, small 1.5 inch display, able to film in H.264, HDMI-output and W-Fi unit allow using the camera for any purpose. Apart from this the camera is supplied with lots of accessories: waterproof case, fasteners for bike handlebars, helmet, light stand, a belt clip, stickers, metal and plastic adjuster screws and etc. This camera is second to nonе as for its package content and considering the price it becomes a unique offer on the market. Shooting is performed by means of 3MP CMOS matrix. The lens focal distance is 2,8 mm due to which everything around you is filmed. The image has Full HD resolution at 30 fps. It is possible to increase the latter parameter only by decreasing the resolution up to the ordinary HD. Though the sound the camera provides isn’t quite perfect and because of its small size the battery has small capacity, that’s why you won’t without the supplementary one. SJCAM SJ4000 WiFi feature is its 1.5 inch display although in the majority of cases the user will turn it off. This display will serve those who don’t want to use their smart phone for nothing, since if you are shooting in the rain, for example, no one will take an expensive gadget out of the pocket to take a few pictures. This model has a wireless unit that ensures remote control or transferring the files to some other device. The camera is poorly fixed within the waterproof box. This is another one very-very good camera. It shoots with high resolution, takes perfect pictures, but what is especially cool it is 240 fps with HD quality and 120 fps with Full HD – this is something incredible! If you intend to record video at high bit rate with image stabilization (only at 1080p), this camera is the best choice! Photo and video compilation quality performed by Sony FDRX3000R/W 4K impresses. The camera shoots 4K Ultra HD video at 100 mb/s, as for the photos and frames obtained from Sony FDRX3000R/W 4K camera they are incredibly good from POV of camera standards. All these are insured by such camera functions as embedded exposure compensation and image stabilization. 4K Ultra HD video mode in Sony is filmed in highly efficient format from Sony XAVC S 100 mb/s, but it also means that this camera requires SDXC card. This is crazy – Sony FDRX3000R/W 4K has an embedded stereo microphone. Not many 4K UHD HD action cameras have it. Sony can produce quality audio recording which perfectly completes its high quality video. The camera has very good noise damping to turn down wind or water sounds when shooting, which surely be appreciated by many users. The camcorder also has image stabilizer, white-balance is set automatically, there is a small display, H.264 and MPEG4 video formats are supported. The action cam has a microphone input, embedded NFC and Wi–Fi units as well as GPS – this is a complete set of all possible technologies. The manufacturer supplies the camera with a supplementary battery, waterproof case and a set of stickers-fasteners. The beginners will appreciate the device small size and solid construction. Of course, Sony FDRX3000R/W 4K doesn’t have such fasteners as GoPro Hero, however the camera is for hiking, diving, cycling, jogging and so on, which is possible only when the camera case besides its nice appearance can resist dust, splashes and severe weather events. Finally, Sony FDRX3000R/W 4K waterproof case broadens the shooting possibilities – 10 meters under the water – no matter if it is a sea or a freshwater pond – how do you find this characteristic? The quality of obtained video is also great, even better than that of GoPro HERO4 Black. Duration of offline mode operation is perfect, too: the camera can work more than 2 hours. High price of the camera and its accessories can be considered a drawback though. Despite its low price DBPOWER N6 4K has a high quality design and rather meritable filming quality. The camera has IP68 rating and it can stand getting under water up to 30 meters deep. The device quality construction is ensured using a metal casing. The camera itself is a 20-megapixel one with Sony IMX078 sensor. You can film 4K at 24 fps or 2,7K at 30 fps. The device wide angle lense has a diagonal of 170 degrees. The camera is also equipped with hacking prevention technology. DBPOWER N6 feeds from Novatek NTK96660 chipset, it has a battery of 1200 mАh capacity. As for the battery – there are even two of them in the device set. 2.31” led display ensures easy preview of your recordings and it also has protection against scratches and finger prints on it. The camera can be connected to a smartphone using Wi-Fi and then you can manage all the processes using your gadget, which gives you more freedom and device’s features available. More good news is that DBPOWER provides support to microSD cards up to 64 Gb. HTC RE Camera is an action camera for everyday use, for ordinary people who will hardly ever go snowboarding or diving. Obviously, RE Camera allows doing all of these, but still the camera is stylish, good-looking and fashionable device IMHO. The company has designed a nice and unusual device capable of taking pictures and filming at different conditions and to download these into the Internet or some cloud storages. So, who is a potential user of this camera? Let’s try to describe him: he is young, he has no time to get into all technical details of network technologies. This person is not very interested in video quality as well, what means more is the camera mobility, connection and control simplicity, the camera is ready to film or take pictures once it is on. HTC Re is an example of completely different design and style concept for action cameras. HTC Company having designed its latest offer has relied on ordinary customers. Year after year videos of some thrill seekers become popular. They record how they fly, ride, jump and other crazy things. But what should the others do? Those who don’t go out often and don’t test themselves by doing any of above mentioned. HTC has thought about these people and created for them this camera, which resembles more a periscope or an inhaler. Its case is made of smooth glossy and very nice on the tough plastic. The camera can easily fit into your pocket. It’s not longer than 10 cm and it weighs 65 grams. The camcorder has 146 degrees widescreen objective lens and it has 16 Mpx matrix. Despite that it doesn’t have automatic image stabilization and auto focus still it perfectly deals with its tasks. HTC Re is equipped with Grip-sensor, accelerometer, Blutooth 4.0LE and Wi-Fi unit. The charged battery ensures 2 hours of continuous filming. The action cam is so small, that it has neither a display, nor “on” button. It looks very nice. Grip-sensor automatically turns the camera on right when you take it into your arms. It has only two buttons – with one of them you take pictures or turn video recording on and the second one turns Slow motion recording mode on. The filming itself starts when simply pushing the main button and when pushing and holding the button the video recording mode switches on. HTC Re case is made of quality glossy plastic which allows using the device under the water at about 1 meter deep for about half an hour. To adjust some parameters of the camera you’ll need a smart phone or a tablet, where you should install a special app first. However, this adjustment process can be done only once and the camera will remember it. You can set video quality (HD or FullHD) and photo resolution. You can also control the camera remotely via any smart phone, using its display as an object finder. By means of the app you can turn on the camera TimeLapse mode as well. Possibly, someone would like to compare RE Camera with GoPro one, but it won’t be a meaningful comparison. Yes, - both devices are compact action cameras for filming all the stuff around you, but this is where their similarity ends. 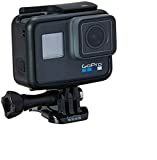 GoPro is an action camera for professionals, it is a protected device, often used for filming extreme sports, where first of all protection and basic functions are important. The camera angle is 360 degrees; however, 360Fly isn’t the only one action cam on the market that performs widescreen filming at 360°. But its price (rather low than that of its rivals) and unique design – these make the device really the one and only that is being bought by a thrill seekers. 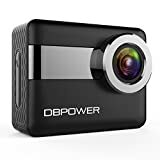 A potential owner of the above mentioned widescreen action camera seems to be a young man with active lifestyle and he is eager to share all the beauty of the places he’s seen with his friends. A businessman and a big fan of extreme sports - Peter Edderton is sure that his 360fly camera is to become the main rival to GoPro and it’ll popularize the virtual reality technology which is starting to pick up stream nowadays. 2018 is considered to become a landmark for this direction on the market and it looks like the camera designer has foreseen it. In fact, such companies as Facebook and Google are already launching the process of spherical video support on video services. As for 360fly camera characteristics – it has a quality sensor to film video with resolution 1504 х 1504 p at 30 FPS. Spherical shape of the gadget and the lens with f2.5 aperture allow creating solid video frames. The modes supports microSD up to 32 Gb and it has a waterproof case. Surely the device supports wireless Wi-Fi functions, Bluetooth for synchronization with a tablet or a smart phone to control the camera remotely. The camera battery capacity is 1600 mAh that insures about 2-3 hours of offline mode operation. The fact that the camera battery and SD card aren’t portable is disappointing for sure. However, as the camera service has shown both the battery charge and SD card are quite enough for 1,5 hours of continuous filming. This time is quite enough even though you’ll be editing the video later. As for the 1st generation model 360fly is rather well designed without any unnecessary stuff, it’s the camera where additional settings may only get the video worse when shooting at 360°. The screen. Its necessity is rather controversial. From one hand it helps to control the camera, but the camera’s energy usage rises in this case. From the other hand the screen is a very useful thing – you see what you’re filming and you can adjust the camera settings without using any additional devices. Sensors. The presence of G-sensor allows activation of the filming process immediately - it senses the tiniest movement of the camera or the object that is being filmed. If you are planning to use your action camera quite often - as a drive recorder, for example, then it wouldn't be superfluous to have G-Sensor and GPS in it. Optional interfaces mean additional features such as connection to remote control device, external microphone and mobile devices. All of these widen your action camera application range. Ways of the camera fastening. Rather often the action camera has only several fasteners, the others you should buy on your own. These cameras can be mounted on a hand, light stand, mask, glasses, helmet and on flat or cambered planes. You may also choose a multipurpose fastener. The most spread fastener type is a standard one used by Gopro. Keep this in mind if you are planning to buy lots of additional camera accessories. Check how often the manufacturer produces firmware upgrade for its cameras and when the last version was released. This will make you feel more secure that any software problem that arises will be settled and that, eventually, the filming quality will be improved. Find the camera source files in the internet and check their properties for maximal bit rate. The higher the bit rate is, the higher quality video-images you get. If you aren’t planning to use SlowmoVideo (slowed down video), then 30 frames per second will be quite enough. Stabilization isn’t luxury, it’s a necessity. No one likes watching a shaking video, so choose a camcorder that has a stabilizer. Differences in action cameras shape and weight aren’t as crucial as they seem, but in some cases you should pay attention to these. You might be wondering – then how to choose an best action camera? It’s simple – ask yourself a question: «where will you video find itself in the end?». If you are filming videos for family use with Full HD resolution, you don’t want to edit or correct anything. Or if the main task of the camera is to be used as a drive recorder, then action cameras with resolution up to 1080р and 30 fps will do. But if you are a blogger or you want to become one you should take into account that most of utube content is being watched with resolution not more than 1080р. However, when editing the video SlowMo mode may be required and here you’ll need cameras with 1080р at 60 fps. As a rule, such cameras have maximal resolution not less than 2К. If your intension is to film some detailed additional stuff with unique camera angles: views from quadrocopter, for example, and then edit them and add some video from other more professional cameras – in this case you definitely need action camera 4K. And it’s not just about that you are still going to use this video format, it’s about the matrix quality which will give you more detailed image even when filming with lower resolution. And what is more – in case of 4K camera you’ll always be able to crop a picture to be 1080р without any loss of quality. The higher is the resolution and the more frames per second a camcorder can film, the more expensive it is. Any digital videocams can be conditionally divided according to their filming maximal resolution and frames per second rate. For action cameras these values will be the following: 720р, 1080р, 2К, 2.5К, 4К and fps correspondingly: 30, 60, 120, 240 and values equivalent to these in PAL system. Such a gradation sufficiently affects the camera price within one brand. Vast majority of modern action cameras record video with maximal resolution Full HD – 1920*1080. There are cameras that can film with higher resolution – 3840*2160, for example, GoPro Hero 4. However, I can’t help mentioning that resolution of the resulting image obtained from different cameras with the same stated parameters may differ; therefore it would be nice to watch some videos filmed by the owners of the device you are interested in before buying it. You also should consider how the camera behaves not only under some ideal conditions, but also if the light is not sufficient or etc. Action cameras have several important parameters that influence the filming quality directly. Below I’ll give them in details, but if you need your camcorder asap, then you can skip this part. However, I’d better read these. A camera glass – the amount of light that gets to the matrix depends on this component. The more light passes through the camera glass per second, the higher quality image is obtained. And this is directly proportional to the camera lenses quality. Manufacturers don’t specify which optical components are being used, but SONY, for example, states that they use optics made by world-wide known ZEISS. Wide view angle is important since you always want to capture as much as possible details of what is going on. Most models offer camera angle 100-170 degrees and some even a bit more. On the other hand narrow camera angle allows concentrating and focusing on some details, but this isn’t what is required from an action camera in the majority of cases. But the wider the angle is, the shorter the lens is and wide-angle lenses cause perspective distortion. The lines become curved, so having the function of image correction won’t hurt. After receiving the image the camera automatically aligns curved lines. A matrix this is the most important camera component which directly influences photos and videos quality. It can be considered the same as film in old photo cameras. Wow, what do you need to know about the matrix? The larger are the matrix and its elements-pixels physical dimensions, the more light they capture and the more high quality image you get correspondingly. The matrix size equal to 36?24 mm is a good one for reflex cameras. Frames per second rate: 24 fps is regarded to be enough to get the main picture with the human eye. But the images given with 50 fps seem to be smoother. The matrix ability to capture video with high fps rate not only makes the final video smoother, but also provided with corresponding video processing it allows applying SlowMo effect. This is when the video is being slowed down twice or more. In the matrix and action cameras technical characteristics this parameter is always indicated separately for each resolution. The higher is the resolution, the more efficient the matrix has to be to save maximal number of frames per second. The lower is the resolution, the higher is fps rate. The majority of cameras record video in such formats as MP4, AVI, MOV, which is quite enough. H.264 video format is necessary to film the highest quality video. You might be wondering – what else should I know about the matrix? Different matrixes vary in their dynamic range – this is the ability to show simultaneously dark and light colors of the scene. The wider the dynamic range is the more details you get on a contrast image. For example, when filming in sunny weather the sky pattern and the filmed object details will be seen both. A processor is a “servicing” camera component and it has to correspond to the matrix abilities in order to perform maximum quality results. Sometimes it happens that the matrix is capable of much more but it is limited by the processor abilities and due to this the quality of the image obtained by the matrix forcibly decreases to lessen the processor load. That’s why 4K matrixes with high resolution of video recording require a powerful processor such as Ambarella A9. For matrixes with lower resolution a processor can be less powerful correspondingly. But images processing isn’t the only task for this device. All action camera components are connected with each other by means of a processor to provide complete functionality of a camcorder. The main thing you should know about the processor is that it has to be powerful enough to manage all the above mentioned responsibilities and at that generate as less as possible heat. Camcorder software quality is very important as well. Quite a lot depends on the company programmers: namely, what maximum parameters they’ll obtain from the available hardware by means of their software. Sometimes a company releases a “raw” product on the market and after that updates it by improving its key features and removing the existing errors by firmware updates. Therefore, when buying an action camera make sure that its manufacturer provides technical support for its products by releasing new firmware updates continuously. This is true especially for nameless brands. The smallest models don’t have a screen at all and you can adjust camera’s settings only by connecting it to a mobile device. The other models have a screen which is black-n-white and it serves only to set recording modes. However, there are full-color led displays where except for the recoding settings you can select the camera angle by using the screen as a viewfinder and to watch the video footage as well. Screens also differ in their size – the large the screen is, the more comfortable it is to use it. But if the camera doesn’t have a screen, then some models have a stand-alone unit, though it increases the camera dimensions a bit and makes it impossible to use the camera in a waterproof case or with other accessories. But the best model ever is the one with embedded display and touch-screen, where you don’t need any special buttons, since you manipulate it by touching the screen. Gopro cameras and Xiaomi Yi 4K new model have such screens. WIFI and Bluetooth units make the life of camera owners much easier. Using these units you’ll be able to transmit direct video signal right into your mobile device. It’s very helpful when a camera is installed in such a place where you don’t have the ability to look at the camera screen and select better camera angle. Or, when the camera is far from you, so you have the ability to start and finish recording by means of remote control. Except wireless modules there are embedded plugs that broaden camera’s features. For example, when connecting your camcorder by means of USB to your computer you’ll be able to use it as a web-camera or as multimedia-player with the image output onto the TV screen via HDMI port. If there is a mini USB port in the camera, you can plug in an external microphone and improve the recorded sound quality by this. If the sound is important then pay more attention to this property since not all camcorders have high level of sound recording. When filming handheld you’ll face continuous shaking of the frame. To avoid this you just can’t physically hold an action camera steady. To compensate these vibrations an embedded stabilization systems are used. By means of electron gyroscope the camera defines its location in space and fixates the tiniest changes in the environment. In expensive cameras a floating lens is used. The info obtained from the gyroscope directs how to deviate the lens more efficiently to compensate any given vibration. So, as a result you get a stable “floating” image. Cheaper cameras don’t have this floating lens and to transmit the image not the whole sensor (matrix) diagonal is used, but just its half. The image that overrides the border is used to compensate the vibrations. I.e the active zone of the matrix is sort of “floating” within it. When activating this function you may notice that the camera angle of view becomes a bit narrower and this is what gives the spare space for shifting in case of the frame shaking. Nowadays an action camera has become a multi-purpose device. In particular, they are more often used as drive recorders. Usually, in this mode the camera records separate video fragments of a pre-set duration: 3, 5, 10, 15 minutes. This is done to enable re-recording when the storage is lack of free space. Not to delete quite a large video file which may contain some important data, the file is divided into several parts. G-Sensor – is what helps to save the necessary part of the information without deleting it accidentally. In case of a car crash the sensor responds to a hit and makes it impossible to delete the part of the video file, where the crash was filmed. To delete it you’ll have to format the flash-card using computer. If your camera has a GPS-sensor, it’ll record the coordinates of the place where the car crash happened. All this information has to contribute to legal decision-making during the trial and to increase evidence base. Some models of action cameras such as Garmin Virb X manage to add recording of heartbeat data into their features as well as the travelled distance and a span distance and if it is necessary to measure a rider, wind or a ship velocity and lots of other things that allow comparing such camera with an on-board computer. Gopro Company is an ancestor and popularizer of action cameras. As the time went by lots of different accessories for action cameras appeared with a corresponding fixing standard. The majority of modern manufacturers don't take risks trying to create their own types of fixation since this will lead to the necessity to produce their own product line of competitive accessories for their cameras. That's why they are using the standard used by Gopro Company. 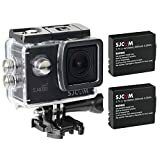 When choosing an action camera you should take into account the above mentioned not to limit yourself with the decision contents when selecting accessories for it. Different manufacturers use different approaches when supplying their devices. For example SJCAM Company is very generous when equipping all its cameras with lots of additional installation hardware. As for Xiaomi the situation is quite the opposite – quite a lot of things, even the necessary ones – such as waterproof case you'll have to buy yourself. Therefore, when talking about the price of action camera consider the set of additional accessories it has. The most popular ones are rectangular, cylindrical and cubic shaped action cameras. It’s pretty difficult to give any particular recommendations in this respect – just keep in mind how you are planning to use your camera when selecting which one to buy. For example, a cylindrical shaped camera will do best for installing on a motor bike helmet, because at high speeds it creates less resistance to wind. It may appear that a camcorder weight is so small that it may not play any part when choosing one. However, if you’d like to install the camera on your head or just to film handheld for a long time you’ll feel the difference in camera weight even if it is several grams. However, it’s not worth chasing neither small sizes nor light weight of a camera. The drawback of a camera small size starts from absence of display and ends with the battery size and as a result it affects the camera operation time. Though, in some particular cases it’s possible to sacrifice all other features for the camera size. Special focus should be put on the accumulator capacity and the duration of camera offline work, since it’d be rather disappointing if the camera works for about 40 min and turns off, when there’s so much left to film. It’s desirable for the camera to perform at least 2 hours of offline work, but there are some models that can even demonstrate 5 hours of continuous offline operation. The auxiliary battery will also be helpful, so when buying a camcorder it’s better to buy one at once. When selecting the device study the battery capacity (mA/h) and the offline operation time indicated by the manufacturer. In real life Sony camcorder models outrun GoPro and Garmin cameras as for this parameter, but there are less popular models such as Liquid EGO that is capable of offline filming for 5 hours. Now: which SD card to choose for an action camera? Here is another one parameter that may influence the filming duration and this is the SD card capacity. It’s desirable to buy SD cards of 10-th class at that taking into consideration that a standard microSD has 32 Gb and it can hold about 200 min of recorded video with resolution Full HD 1080p or it’s about 34 thousand photos with resolution 2560x1920 pixels (5 megapixels). It’s better to choose SD card of one of these manufacturers: SanDisk, Lexar, Delkin, Transcend. And it’s better not to save on SD card to avoid further problems with recording and reading video files. It’s clear that the larger the capacity is, the better. We advise to buy at least 32 Gb SD card, but 64Gb is still better).